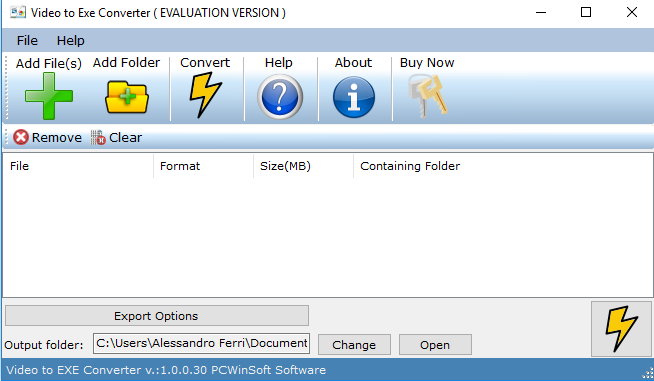 Video to Exe Converter is a video file converter that converts video files to standalone executable files. Movie formats supported are: WMV, MOV, MPG, MPEG, MPE, AVI, ASF, ASX, QT, MP4, MPEG-4, FLV, TS, 3GP, FLI, M1V, M2V, MJPG. Output format: EXE. You are hereby licensed to make as many copies of the SuperLauncher Trial Version as you wish and distribute it to anyone provided that all files are intact. You must distribute the install form of the SuperLauncher Trial Version (you must distribute the INSTALL file, not the files resulting of an installation). You are not allowed to sell the SuperLauncher Trial Version (except for shipment and handling charges). Press is authorized to distribute it on any Cover Disk, CD-ROM without permission from PCWinSoft. Shareware Catalog Web sites are authorized to distribute it as a download file (hosted or linked to PCWinSoft site) without permission from PCWinSoft.